← 409 "Eternal Moonshine of the Simpson Mind"
A medieval tapestry shows the Flanders stealing the Simpsons's couch. The Simpsons then take it back and kill the Flanders. Teacher did not pay too much for her Condo. "E Pluribus Wiggum" is the tenth episode of Season 19. It aired on January 6, 2008. It guest stars Jon Stewart and Dan Rather as themselves. "Springfield becomes the site of the first presidential primary. 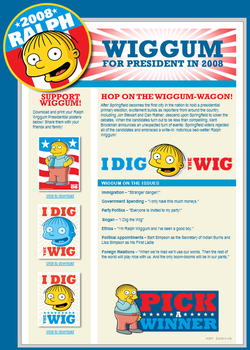 The townspeople soon get sick of all of the presidential candidates sucking up to them, and decide to support their own write-in candidate: Ralph Wiggum." Homer leaves work, and when he is reminded that his diet is starting on the first day of the month (which is today), he decides to have one last binge at Springfield's Fast-Food Boulevard. After filling up, he decides to throw away his wrappers and the contents of his car in a trash can outside of a Krusty Burger, tossing away a leaky battery and a lit match. The acid from the leaky battery eats a hole in a gas main, with the lit match igniting the gas. A fire starts which soon causes nearby gas pipes to explode, destroying Fast-Food Boulevard completely. At a town hall meeting, the enraged residents of Springfield demand that Fast-Food Boulevard be rebuilt immediately. To fund the reconstruction, a bond measure is proposed, to be voted on when Springfield's Presidential primary election is held. As the primary is too far in the future, Mayor Quimby moves it to the upcoming weekend, making Springfield's presidential primary the first in the nation. Candidates and reporters head to Springfield when they hear the news. Lisa soon discovers that none of the candidates in the election are compelling. The candidates flock to the Simpsons, who are undecided. Their home is filled with people and their yard is covered with reporters; helicopters and news vans surround the lot. Kent Brockman asks Moe which party he likes, Moe replies, "I like girls." When Kent asks if he is a registered voter, Moe says that he is a "registered something". When voting day arrives, an angry Homer and other citizens hold a meeting in Moe's Tavern. Homer suggests the people vote for the most ridiculous candidate, whom they choose after Chief Wiggum suggests himself. The same night, Kent Brockman announces an unexpected turn of events: Springfield has rejected all the leading candidates and voted for 8-year-old Ralph Wiggum, who wins the primary, much to the shock of Lisa Simpson. Ralph is immediately embraced as the leading candidate, and Homer and Bart embrace him by becoming his fans. Lisa, however, is miserable, as she knows how slow Ralph is. A news report (called Headbutt) shows Ralph has no idea of which party's nomination he is seeking. The Springfield Republican Party decides to fight for Ralph, knowing certain victory will come during the election. The Springfield Democratic Party knows that greatness will come once they win Ralph over. The leaders of the Republican and Democratic parties break into Ralph's home, wanting to fight for him. Lisa confronts Ralph amongst the media frenzy, attempting to convince him to not run. Ralph tells Lisa he wants to run so he can bring peace between warring nations. He is proven to be a formidable candidate, and both the Republicans and the Democrats support Ralph for president. The episode ends with a political commercial for Ralph, sponsored by both parties. Michael Price's son coined the term "Fast-Food Boulevard". A promo of the episode that included Ralph's blog, wiggumforprez08.com. 8.2 million people watched this episode. TV Squad said that it was an episode with many jokes and sight gags, his favorite being the episode's guest stars and the many references but did not like the abrupt ending. IGN said the episode had all the ingredients that seem to make it a classic episode. They enjoyed the theme of Homer and Fast-Food Boulevard, the political mocking, and the centering of Ralph, and like Keller, he felt the show seemed to shun Ralph until the end; he gives the episode a rating of 6/10. 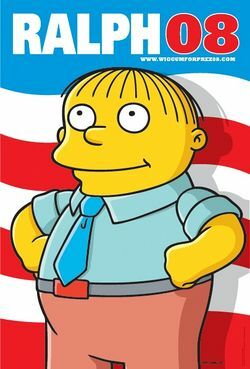 Entertainment Weekly reveals that it received positive reviews from the site, and Ralph Wiggum had their vote! "E Pluribus Wiggum" caused controversy in Argentina prior to its broadcast there. The controversy was over an exchange between Lenny and Carl - Carl says "I could really go for some kind of military dictator, like Juan Perón. When he 'disappeared' you, you stayed 'disappeared'!". Carl's comment is a reference to the Dirty War in Argentina, a period of military dictatorship during which as many as 30,000 political dissidents disappeared, and is largely regarded as having begun at least two years after the death of Perón, who was elected three times. Some politicians in the country called for the episode to be censored or banned. Lorenzo Pepe said "this type of program causes great harm, because the disappearances are still an open wound here." Some reacted negatively to Lenny's response to Carl's comment: "Plus, his wife was Madonna", a reference to the film Evita where Madonna played Eva Perón. Pepe added "the part about Madonna — that was too much." Pepe's request for banning the episode was rejected by the Federal Broadcasting Committee of Argentina on freedom of speech grounds. Fox decided not to air the episode in Latin America. In an e-mail sent later to the media, the network said that this decision was based on "the possibility that the episode would contribute to reopen wounds very painful to Argentina". However, the Brazilian TV Rede Globo, aired this episode in 2008. Wikisimpsons has a collection of images related to "E Pluribus Wiggum". Modified on June 29, 2018, at 06:44.